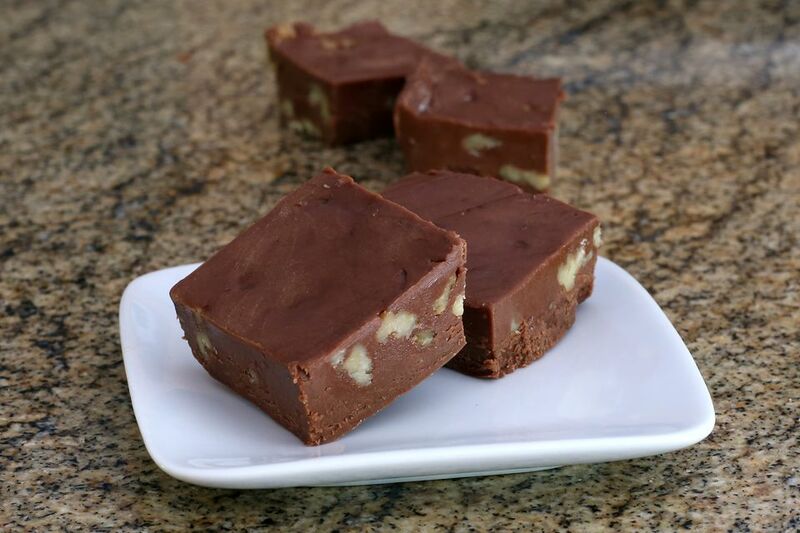 If you've tried other fudge recipes only to find them dry and crumbly, this may be the solution for you. It may seem a bit unorthodox to use Velveeta, but many fudge recipes call for cream cheese to give the final product some silkiness. Velveeta replicates that texture in this recipe, and has a longer shelf life than real cream cheese. Velveeta often gets a bad rap, but it makes the fudge smooth and creamy, and you might have some fun asking people to guess the secret ingredient. No one needs to know it's the main ingredient in this recipe unless you want them to, because chances are they'll never guess. For those who have made (or tried to make) fudge before, be prepared for this recipe to set up a bit differently than other varieties. The Velveeta will make the fudge mixture a bit sticky and somewhat stiff. If you have a stand mixer, use the paddle attachment or dough hook. You may want to chill the fudge in a loaf pan instead of the standard 8-inch or 9-inch pan, so it sets up well. Butter a 9-inch square pan. It's best to avoid cooking spray since this recipe produces a heavy, dense end result. Cut the Velveeta cheese into small cubes. They don't have to be symmetrical, but smaller pieces will be easier to work with than a large chunk. In a large nonstick saucepan over medium heat, combine the butter and cheese cubes. Cook, stirring frequently, until melted and smooth. Remove from heat, but don't allow to cool. If it thickens, add a teaspoon of hot water to reduce the stickiness. Combine the confectioners' sugar and cocoa and whisk to blend (or sift them together). Add the sugar and cocoa mixture to cheese mixture, mixing well. Add the vanilla and nuts and blend well. The mixture will be thicker than you might expect, but that's OK.
Press the mixture into the prepared pan; chill in the refrigerator (not the freezer) for about 2 hours or until firm.Cut into squares. Butter the pan lightly and line it with a large sheet of parchment paper or aluminum foil, leaving the ends long enough to lift the fudge out of the pan once it's slightly chilled. You can use plastic wrap to cover the fudge before placing it in the refrigerator to help smooth the top of the fudge.